In March, Southeast Asian media flocked to Jeju Island on multiple occasions. One was a visit by Malaysian singer Wany Hasrita to film her new music video. During a five-day stay in mid-March, videographers captured the beauty of the island, including the canola flowers of Sanbangsan, Seopjikoji and Woljeongri Beach. In the video the singer wore hanbok, traditional Korean clothing, rented from a local shop called Miya’s Closet. Broadcasting station Net.TV Indonesia sent the crew of its travel show to the island in March too, so it could introduce the island’s beauty and culture to its viewers. The show covered tourist attractions such as Dongmun Market, Yongduam Beach, Ihoteu Beach and Seongsan Ilchulbong. It also looked at the island’s Muslim-friendly restaurants and accommodations. “The beautiful scenery in Jeju was attractive and particularly impressive for haenyeo,” Net.TV Indonesia reporter Laras Puspitorini said after an interview with the island’s famous female divers at Yongduam Beach. The divers are known as haenyeo in Korean. 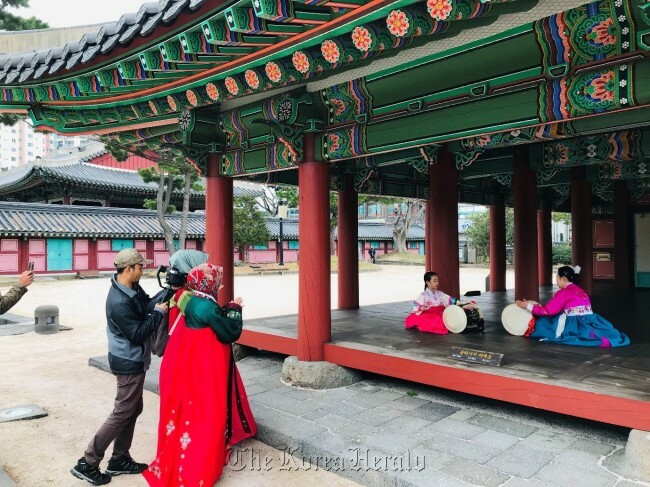 “There is a growing consensus that Jeju Island needs to tap into the Muslim market to develop and diversify the quality of tourism,” said Daniel Lee, CEO of The Planet Jeju, the travel agency that sponsored the two events.